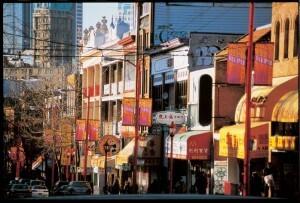 Vancouver’s Chinatown is North America’s third largest, and reflects the dominant Chinese minority group in Vancouver. There is an authentic oriental ambiance within Chinatown, which immerses you in Chinese tradition and culture. Walk north on Burrard until West Pender St. Starting from West Pender St. and heading east, you will pass through Granville St., Homer St., & Cambie St. (about 6 to 8 blocks). When you walk past Cambie St., you will see the Millennium Gate erected across the West Pender St. near Abbott St.. When you get through the Gate on Pender St., you already arrive at the Chinatown area. Or just follow the Silk Road banners from Downtown Vancouver Public Library, it is only a 15 minutes walk to Chinatown area. Or you can try the Silk Road Route from Downtown to Chinatown. The Silk Road Route is the first pedestrian walk connecting Chinatown to Downtown Vancouver. Clearly marked throughout with colourful banners and road signs, this self-guided walking tour encompasses all of Chinatown’s activities services and cultural highlights. Starting from the city centre’s Central Library, the course takes you through Keefer Street, International Village, the site of the future Millennium Gate on Pender Street, the Chinese Cultural Centre, the Chinatown market area and Dr. Sun Yat-Sen Classical Chinese Garden. There are many designated bicycle routes in Vancouver area, and some take you to Chinatown area: those on Pender St., Keefer St., Union St. and Quebec St. For further details, please go to the city of Vancouver cycling page and download the map. From any Skytrain Station, you will get off at the “Stadium – Chinatown” Station. 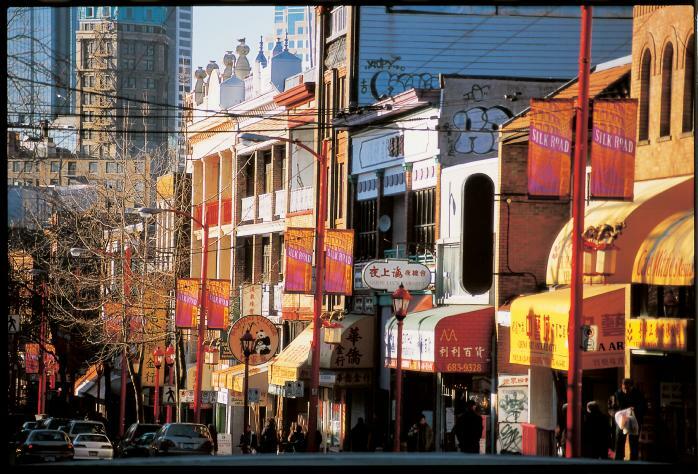 Look for the sign “Chinatown” and walk east down Keefer St. for three blocks, which will bring you to Chinatown. For detailed transit information, call 604-953-3333. Take the bus #22 Knight or bus #19 Metrotown from Downtown Vancouver. Get off the bus at the next stop after the Millennium Gate. Bus C21Yaletown/Beach/Burrard Station and Bus C23 Main St. Station/Davie stop at Keefer and Columbia St. If you want to purchase some of the rarest jewelry or antiques around then you can look into visiting this store while visiting Chinatown in Vancouver. Not only do they sell jewelry of any kind, but they also will tickle your fancy with antiques from past times. Handmade crafts from Chinese culture are also sold here for your shopping pleasures. They’re at 234 Keefer Street. Call them at 604-633-1318. Located right in the heart of Chinatown in Vancouver, you can be sure to get all of your seafood needs in this one stop shop. You will be able to get frozen seafood for affordable prices, and take them with you wherever you’re headed off to next. All of their seafood is authentic, and ready to please your taste buds when you cook it up for your enjoyment. Located at 290 Keefer Street. If you need more information on their prices, services, or the seafood that they offer, call them at 604-662-3100. This restaurant is one of the highest rated in Chinatown, but we’re not happy that they choose to sell shark fin soup. You can get fresh live seafood cooked to order, a variety of Dim Sum or specialty vegetarian dishes. Located at 137 East Pender Street. Call 604-683-8816. Other than the year-round vast array of great restaurants, on weekend evenings from late May through to September, thousands of visitors pour into the closed streets for the popular Chinatown Night Market. The Asian-style flea market offers a host of great finds like souvenirs, novelties, and tasty treats. You can get more information about this event when you call 604-682-8998. To inaugurate the new millennium and commemorate this “journey in time”, the Vancouver Chinatown Millennium Society designed a physical structure representing both the past and the future. The Millennium Gate, located on Pender and Taylor streets, incorporates both eastern and western symbols with traditional and modern Chinese themes in its construction and appearance. The gate, opened in July 2002, is a project with a mandate to strengthen Chinatown’s image and joint community involvement. Chinatown Centers around the Chinese Cultural Centre Museum and Archives; it features a Ming Dynasty styled building, exhibits, and themes such as the Gold Rush, Chinese Canadian Military, and traditional Chinese calligraphy. The West Han Dynasty Bell is the centerpiece for the historical alley in Chinatown and was a gift from the City of Guangzhou to the City of Vancouver. The Sam Kee Building is the world’s narrowest building, only 1.8 meters wide. There was an old restaurant at this site called Vi’s. It belonged to Jimi Hendrix’s grandmother, Nora Rose Moore Hendrix. While Jimi attended private school, he lived here with his grandmother. It was later turned into a shrine dedicated in memory of Jimi Hendrix. If you want to stroll through the shrine, and learn a little more about the notorious singer and guitar player then you can stop by 207 Union Street in Chinatown. The Chinese New Year Parade, Vancouver Chinatown’s signature event, happens every year in January or February. With lion dances, cultural dance troupes, marching bands and more, this parade is a cultural extravaganza not to be missed. Come see the sights, sounds and festivities of Chinese New Year to celebrate! The Carnegie Community Centre at 401 Main Street houses a library and a number of community events. Chinatown offers something for everyone.